In October 2015, Hurricane Patricia became the strongest storm ever measured by the National Hurricane Center. But what really worried authorities was the speed at which Patricia amassed her strength. The storm's sustained winds increased from 85 miles per hour to 200 in 24 hours—the greatest 24-hour rise in intensity ever observed in the satellite era. While forecast models have made huge strides in the last 30 years predicting the tracks of hurricanes, they still have a difficult time predicting the rate at which a storm will intensify and become dangerous. Luckily, Patricia landed in a sparsely populated area of Mexico and quickly lost strength, sparing communities there much of the catastrophic destruction many had anticipated. Now, a new study in the journal Nature Communications shows that storms like Patricia that grow rapidly are responsible for an odd phenomenon in tropical cyclones overall: stronger storms are sometimes more common than moderate ones. In this, tropical cyclones stand in stark contrast to most other kinds of weather systems, in which stronger events are uniformly rarer than moderate ones. The results may have implications for climate model projections. They may add a new dimension of uncertainty to climate models that aren't able to distinguish between storms that might intensify rapidly and those that don't, according to the team of researchers at Columbia University who conducted the analysis. Using data from 3,000 tropical cyclones that tore through the world's ocean basins between 1981 and 2012, the researchers first organized the storms according to their lifetime maximum intensity—the highest category strength they achieved. In doing so, they noticed something odd. "Normally, when we group natural events like this, we expect to see a distribution where more extreme events are less frequent," says lead author Chia-Ying Lee, a postdoctoral research scientist at the International Research Institute for Climate and Society. "The extreme events should occur less frequently than everything else." Earthquakes, tornadoes and most other types of natural hazards behave this way. But instead of a "normal" distribution, one with a single peak, the tropical cyclone data showed two. On the right side of the distribution, where the frequency of the more intense storms should slide lower and lower, it rises first before dipping back down again. "While other tropical-cyclone researchers have previously pointed out this odd behavior, no one has really tried to explain it in a satisfying way," says coauthor Adam Sobel, the director of Columbia's Initiative on Extreme Weather & Climate and a professor at Columbia Engineering. "When we saw the second bump in the distribution, we wondered if it could have anything to do with rapid intensification, which is such a well-known issue and comes up often in tropical-cyclone research," says Suzana Camargo, of the Lamont-Doherty Earth Observatory. Here's how they showed the link to rapid intensification. 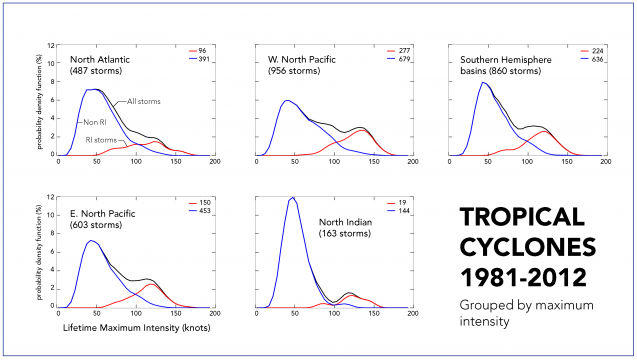 The researchers split the tropical cyclones into two groups: those that rapidly intensified and those that didn't. Sure enough, when they plotted the data the results clearly showed that the double-humped, or bimodal, distribution was really a combination of two normal ones, and that the group of rapid intensifiers was actually responsible for that extra bump. "It's provocative," says Michael Tippett, from Columbia Engineering. "We have this very important climatological feature—the frequency of the most intense storms—which turns out to depend on rapid intensification, a short term weather-scale phenomenon that is really hard to forecast." Exploring this relationship is going to be important, says Lee. The vast majority of intense storms, like hurricanes Patricia and Katrina, Typhoon Haiyan and Cyclone Nargis, are rapid intensifiers and ones we worry about most from a risk perspective, she says. Why this matters for climate models. Most models project that climate change will lead to a small annual increase in the frequency of intense storms along with a small reduction in the total number of storms worldwide. But modeling storm frequency on a climate scale is extremely difficult, so the projections already have some uncertainty built in. The new study may add some more, says Tippett. "Our paper shows that the part of the tropical cyclone distribution which corresponds to the most intense storms, the ones that typically cause most of damage, is connected to physical processes that occur on a weather timescale. If these processes aren't resolved in the climate simulations, it may imply a broader problem we need to address," he says. Sobel cautions that the study doesn't make any conclusions about the usefulness of model projections. "I don't think we've proven anything about how well climate models can simulate tropical cyclones, good or bad, right or wrong or indifferent, but it certainly raises a bunch of questions we want to think about now," he says. Simulating tropical cyclone intensity well requires a lot of computational power, says Camargo. Even state-of-the-art weather forecasting models that have super high resolution struggle with rapid intensification. Climate models have much coarser resolution. "Very few can simulate the category 4 and 5 storms," she says. "Most climate models just don't have the capability to do that yet." Some of those that can are run by NOAA's Geophysical Fluid Dynamics Laboratory. "The observational results in this paper are coming at a great time, because our technology is taking us to the point where we can simulate some of these very intense storms in our models, at least in a climate context," says the fluid dynamics laboratory's Gabriel Vecchi, who authored a recent paper on one such model. "Now I think a big question will be what controls the statistics of rapid intensification. We have theories as to what determines the strongest that a storm could be—the storm's speed limit—but it may be that speed limit isn't really the most important thing to think about when storms are strong, but rather how fast they accelerate," Vecchi says. Why did Hurricane Patricia become a monster so quickly?